Yesterday's post, Final Salute, was the 200th post on LifePrints. I think that's a noteworthy milestone. I'm proud of myself. Two hundred times I've searched and found positive stories to share with you. I think that is an accomplishment. With that said, I'll be taking the rest of the week off. I'm headed cross country to be in a wedding. Not just any wedding but the wedding of someone very close to me. She's weathered a great deal of heartache and the happiness she's found is well deserved. I'd say it's the result of many prayers. I'm not one of those people who think that someone else can make you happy. It can't. If you don't want to be happy you never will. But finding another person of like mind, a person who adores you and loves to make you smile - that's definitely a gift from God that should be cherished and nurtured - and, of course, the by product of such a gift is happiness for those willing to open their hearts. I'd say that the bride at this wedding has an open heart and she is basking in the glow of this new found love. Can't wait to see her and meet this special man. See everyone next week. If it's okay with my special friend I might even post a few photos from the occasion. What could be more positive than a post about LOVE! I hope all of you have a wonderful weekend. Spread some love and peace in your lives. Take care of yourself and love one another - that should be easy. He is the troop nobody wants to see, carrying a message that no military family ever wants to hear. It begins with a knock at the door. “The curtains pull away. They come to the door. And they know. They always know,” said Lt. Colonel Steve Beck. Lt. Colonel Steve Beck knows grief and will carry its images in his heart forever. He is a Marine causality assistants calls officer. It's his job to notify the families of fallen soldiers that their loved one is dead. But it's more than that. This unassuming man willingly becomes the object of their anger and eventually their source of strength. These moving photos are from the photo essay and story Final Salute that ran in the Rocky Mountain News on November 11, 2005. Reporter, Jim Sheeler and photographer, Todd Heisler shadowed Lt. Colonel Beck for one year before writing the piece for the Rocky Mountain News. Later the essay was turned into a book published by Penguin Press. Heisler won Pulitzer prizes for his photos of Lt. 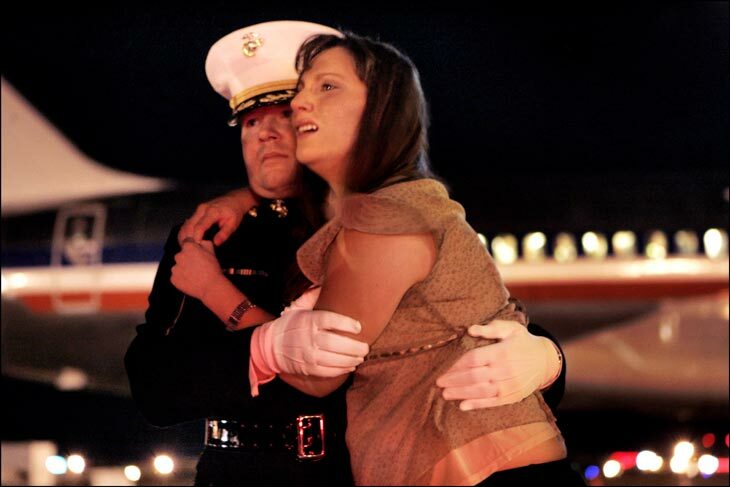 Colonel Beck holding Katherine Cathey, the pregnant wife of a fallen solider and of the arrival of Cathey's remains at the airport. This is a very emotional story. I heard it on NPR on Memorial Day. I cried so hard I had to turn the station. Even researching the material for this article was painful. If this is what I experienced just hearing their stories, I can only imagine how the grieving families feel. Final Salute is a very important book. Everyone should read it or at least read the full essay and watch the slide show. As Americans, we should be fully aware of the consequences of war before supporting our government in any such action. Lt. Colonel Beck is a hero and a saint on Earth. When asked how he felt about his job he said it is an honor above all others. In my book, Lt. Colonel Beck and all those like him are men above all others. I honor him during this week of remembrance. The picture below is of Lake Sidney Lanier, a man-made lake in North Georgia that is the main water source for more than 3 million residents of Atlanta and the outlying suburbs (not to mention parts of Alabama and Florida). This picture was take during the 1980's when the water level was at capacity. The next photo was taken of the same section of the lake in October of 2007. What was once a quiet swimming cove is quickly becoming a meadow. While lack of rainfall is the immediate problem, the underlying culprit is more profound: a water supply that cannot keep pace with a rapidly expanding population. Lake Lanier was constructed in the 1950's at the headwaters of the Chattahoochee and Chestatee Rivers to prevent flooding. The Buford Dam which holds back the waters and forms the lake has produced more than 96 million dollars in electricity since the plant went on line in the late 1950's. Currently Georgia, Alabama and Florida are locked in a battle over this dwindling water source. Upper Chattahoochee Riverkeeper is helping to lead the way to resolution and responsible use. The advocacy group sponsors events on the river to raise awareness about the problems of overuse. Since 1994, UCR has reached tens of thousands of school-aged children through their Riverkeeper Youth Programs to promote an ethic of stewardship of rivers, lakes and streams. Students have gained a greater appreciation of their natural surroundings and have become more knowledgeable about water resources by participating in these programs. The UCR serves as a watchdog organization to ensure that water conservation legislation is foremost in the state government's mind. The group sponsors river and lake cleanups and a floating classroom (glass bottom boat) that's educated more than 10,000 students about the importance of clean water and environmental stewardship. I'd like to say thank you to Riverkeeper. This story has personal significance for me because I grew up on the banks of Lake Lanier and my grandfather's homestead lies beneath its waters at Holiday Marina in Buford, GA. North Georgia is facing a serious problem of water depletion. I applaud the Upper Chattahoochee Riverkeeper for working so hard to preserve this resource for generations to come. UCR's website is filled with helpful information and programs for people who live in this area. Georgia residents use 10 percent more water per capita than the national average. If you are part of this community, please read the water saving tips and ways to help compiled by the UCR. Imagine at three years old learning to carry loads of water on your head. Each year you grow stronger and the load grows heavier. Imagine only having enough food to survive and even though it's nutritious food it's not enough to make up for the hard work your body is doing. There is no energy left over to help your body grow. Imagine that your growth is stunted because of these conditions. Now, imagine that you live in a village where young girls are married off between the ages of eight and eleven and that by the time you are thirteen you are pregnant. Your little body is not prepared for the process of birth. Imagine that you labor for days with no medical help. Luckily your baby survives but you are left with an obstetric fistula - a hole between your birth canal and other internal organs that resulted from the prolonged obstructed labor. The hole causes you to leak urine or feces. Imagine that you are shunned by your husband and everyone you know because of your inability to work and the foul odor you can't control. Imagine you are left to live in an isolated hut all alone or worse thrown out of your village for good. This is the life of over 100,000 young women in Ethiopia. The rate has historically grown by another 9,000 new cases each year. Without surgery there is no cure or hope for a better life. This is where the Hamlin Fistula Hospital steps into the picture. If a woman can get to the hospital, a doctor and staff will treat and care for her for free. They will surgically repair the damage to her body, help her heal physically and mentally, and when she is ready give her help to return to her home village. Since 1959 Dr. Catherine Hamlin has been a pioneer in the treatment of obstetric fistula. She and her husband Dr. Reginald Hamlin opened a hospital in Addis Ababa in 1974, the first of it's kind in the world dedicated to helping the thousands of victims who'd suffered in silence for so many years. Catherine Hamlin, now 84 years old, has been nominated for a Nobel Peace Prize, and the list of her humanitarian awards is impressive. She continues to oversee the work of the hospital and can frequently be found in the operating room performing the delicate fistula repair surgery she pioneered more than 40 years ago. A film has been made that follows the journeys of five women as they travel to the hospital for help. 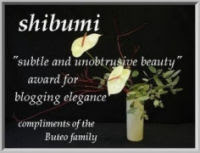 A Walk To Beautiful was named Best Feature Length Documentary of 2007 by the International Documentary Association. I was lucky enough to catch the broadcast premier on NOVA and was deeply touched. The hospital operates solely on donations and grants. If you'd like to help you can become part of the Love-a-Sister program, the donation is $37.50 a month and the yearly total of $450.00 pays the entire cost for one woman's surgery. You will have the satisfaction of knowing you have truly changed a life in a significant way. Greg Gadson is a Lt. Colonel in the United States Army's Warrior Transition Brigade. He loves football, actually he excelled at football in high school and was a starting linebacker for West Point Military Academy from 1986-1989. He is a natural born leader, the kind of guy you'd be looking for on the battlefield or the football field. Gadson suffered serious injury in Iraq which required the amputation of both legs from the knees down. While recovering at Walter Reed Army Medical Center, Gadson received a visit from an old college friend, Mike Sullivan, now the wide receivers coach for the New York Giants. Sullivan recalled, "This man had suffered so much yet he was so happy to see me." The coach brought his friend a signed Giants Jersey, number 98, the same number Gadson wore in college at West Point. Little did he know then that Gadson would give back to the Giants something much more valuable than a team jersey. The Giants team was floundering. Three months after the visit, Sullivan sent an invitation to Gadson, asking if he would come talk to the team before their game against the Washington Redskins. Having lost the first two games of the season, the team had already given up and seemed to be playing without a heart. Sullivan believed that Greg might be just the inspiration they needed. The night before the Redskin's game, Gadson spoke candidly to the team. "You have an obligation not only to your employer but to each other to do your best, he told the Giants. You're playing for each other. When you find a way to do things greater than you thought you could, something you couldn't do as an individual, a bond is formed that will last forever." After a few moments of silence the room erupted into applause. Gadson was at many of the games during the Giant's Superbowl winning season. Several times when a touchdown was made, the team member gave the ball to him. He sat on the sidelines in freezing temperatures during the Superbowl to show his support. The Giants give him credit as the motivator for their turn around. Physically, Gadson is making progress. He spends hours each day in rehab. He uses a wheelchair or two canes to walk on special artificial legs that utilize BlueTooth technology for smooth movement. He is looking forward to a time when he will be back on active duty with the Unit he loves so much. Greg Gadson is an American hero. With Memorial Day fast approaching, please remember the men and women serving our country, especially the ones who have sacrificed so much. "When journalists are deliberately shot, blown up, taken hostage, or imprisoned for simply doing their jobs, that's a crime. When these violations against journalists are committed in an armed conflict, they constitute grave breaches of the Geneva Conventions – they are war crimes," says Amnesty International. 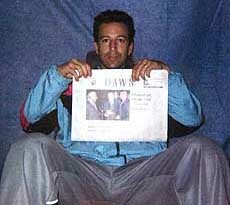 In February 2002 journalist Daniel Pearl was kidnapped in Pakistan and murdered for no other reason than his job. 2006 was a year in which killings of reporters and media staff reached historic levels with at least 155 murders, assassinations and unexplained deaths, according to the International Federation of Journalists. On 23 December, the UN Security Council adopted a resolution in which it condemned intentional attacks against journalists, media professionals and associated personnel in situations of armed conflict and called upon all parties to put an end to such practices.However, around the world, whether in war or in peace, too few states take their obligations seriously. In situations of open conflict, such as in Iraq and Afghanistan, rather than offering protection from the serious dangers journalists face, the authorities restrict their ability to report freely. Journalists are often seen as an irritation – they publish stories that embarrass governments, they give coverage to the opposition and to campaigners, they expose human rights violations and other abuses of power. While individual journalists themselves might not be dissidents, the fact that they write about dissent and the issues that cause strife makes them targets of governments who want to suppress that same dissent. the men and women who risk their lives every day to tell us the truth about what is happening in the world. Governments have their own agendas. People who seek power will manipulate the local media but a freelance photo journalist or a war correspondent can break through the propaganda to show us reality. Their dedication is fierce. Take for example, John D. McHugh, a British photojournalist who returned to Afghanistan six weeks after being shot in an ambush. "I was hooked on the story in Afghanistan. Not the danger or adrenaline, as many suppose, but the story itself. I could see that the reality on the ground was very different to the story being told back in the west," says McHugh. "My photographs weren't getting published much, and the agency I worked for was not interested in sending me back there, but I had no stomach now for day-to-day press work in London. I wanted to be back in Afghanistan, reporting what I believed - and still believe - to be a hugely important story. " We must demand that journalists are protected as civilians and afforded all their rights under the Universal Declaration for Human Rights. We should defend their right to report freely around the world without restriction or limited access. We should cry out collectively when one of these brave souls is taken hostage by a militant group and murdered on video, as was Daniel Pearl. It is in the interest of truth and justice that we do so. 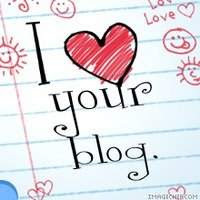 Please look for other Bloggers Unite for Human Rights stories that will be posted all over the web today. As bloggers, we are using our collective voices to speak for those who cannot. Often we find ourselves with sick or hospitalized friends. It's difficult to know what to do to help them. Recently, nurses for the Saint Rose Dominican Hospital system got together to offer these suggestions for providing comfort to families of the sick and also for the patient. Encourage Communication - A sick or injured person may not fully understand tests or exams to b e performed on them. By simply asking your friend, "Do you understand or need a nurse to explain things to you?" you could highlight the patient's needs for the nursing staff. The staff is always willing to help out and spend time making your friend feel more comfortable about the treatment they are receiving. Offer Specific Support - If you ask, "How can I help?" your friend's family may say, "Don't worry. We're taken care of." Try making a specific offer such as, "I'd like to drop by and walk your dog, if that's okay. I could use the exercise myself." Most likely they will happily say yes. Stay In Touch - Parents of sick newborns and children often find that friends distance themselves at a time when they need the most support. Keep in touch. Don't be afraid to mention the obvious; these parents would rather have some sort of communications than none at all. Leave Your Troubles Behind - Emotions run high when a family member is hospitalized, even for a happy occasion like a birth. For the patient's sake don't bring your personal issues to their bedsides. Provide Comfort Items - Patients appreciate having the comforts of home. Soft pillows and cozy fleece blankets make great gifts. A home-cooked meal is a definite pick-me up, but check on dietary restrictions first. Make It Quick or Quiet - Patients often tire themselves out trying to be good hosts to visitors. Keep visits short and reassure the patient that it's okay for them to rest. Respect the Patient's Wishes - Don't get upset if your friend's family decides to limit visitors, especially for childbirth hospitalizations. Women often comment that the most difficult aspect of having a baby is trying to have their own way without offending extended family who want to be in the room. Next time you have a loved one in the hospital use these simple tips to help them on the road to recovery. Above all else, think of how you would want to be treated if you were the one in the bed and follow your best instincts. Take one of these good books to the beach or to the backyard to relax. 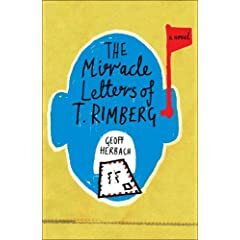 The Miracle Letters of T. Rimberg by Geoff Herbach – an irrerverant and inventive look at mistakes and miracles. Full of life lessons, laughter and tears. The best book I’ve read in a long time. The Anatomy of Peace by The Arbinger Institute – This book could change the world if we all read it and followed it’s principles. The Moms’ Book, for the Mom who’s best at everything - This was a gift from my daughter on mother’s day. It’s fun and entertaining reading. Nourish your body with one of these good foods. Eden Selected Snacks – Fruits and nuts that give you energy to get you through the day. My favorite are the pumpkin seeds and the Pistachios. Anything you grow in your own garden – Nothing beats fresh vegetables from your backyard. You know they are pesticide free and vine ripened because you’re the gardener. Earth Balance Buttery Spread – My favorite butter (well, not really butter). It’s smooth. It spreads well and cooks well. It’s trans-fat free, lactose free and gluten free. But best of all it tastes just like a tub of whipped butter. It’s all I buy unless I’m making Christmas cookies then I have to have real butter. Be a good citizen by exercising your rights. Encourage your friends to register to vote. Be more proactive by participating in the national get out and vote campaigns. Educate yourself on how the political system in your country works. An informed citizen is a smart citizen. Participate in local government. If you want something to change this is where it starts. It’s true that change happens from the bottom up not the top down. Recognize the good people around you. Call an old friend and renew the relationship. When you look at the faces of strangers see the face of someone you love (or at least like). Slow down so you can see and feel the needs of others. Fill your mind with good thoughts. Find news outlets, like National Public Radio, that give balanced reporting to all sides of an issue. When you talk about your life talk about the happy things that happen instead of complaining. When talking to your friends, steer them away from negative or gossipy conversation. Make a game out of seeing how many times you can get them to smile. When you feel no one understands your burden think of me. I understand. I know how you sacrifice everyday so your children can have what they need. I know how you fear for their safety. I know you go to sleep at night dreaming of the future and wondering if today you did the right thing. Was it all you could do? Should you have punished you daughter when she slacked on her chores? Do you yell too much? Do you give in too quickly? Are you passing on your family traditions? Do your children really know you love them? How will you stretch the little bit of food you have left? Where will you sleep tomorrow night? I see you in your mansions, in your two-story colonials, in your modest brick ranches, in your apartments, in your huts, in the shelters, on the streets. I see you hugging your polished children, your smiling children, your hungry children, and your sick children. When all of commerce is stripped away we are the same, aren't we? Life flows from our bodies. We are the vessel of man's existence. We are forever connected to each other through blood, through DNA, and through spirit. Honor who you truly are - the mothers of the planet. We worry and we love. We give and we bleed. We laugh and we teach. We feed, starving ourselves so our children have more, just a little more to help them grow. We barter and we protest. We discipline and we soothe. We mend and we create. What price can be placed on this honor?Salary.com says you are worth over $100,000 per year. Do you believe it? The Bible says you are worth more than the jewels and the riches of the Earth? Do you believe it? The Koran says that Heaven lies at the feet of your mother. Do you believe it? You are priceless dear mothers of the world. You are powerful. You are influential. You are transformative. You, above anyone else, have the ability to shape the future. Don't be silent when you have valuable insight to share. Don't scream when a soft voice could change a hard heart. Don't believe you are less than or unimportant because you don't draw a paycheck for what you do. Thank you. I hope your families’ thank you in whatever way they can – hugs, cards, letters, flowers, a day off, a smile. I’m sending my love and gratitude to all the mother’s of humanity. You are my sisters and I love you. Never give in. Never give up. Never lose faith. You hold the beauty and the tragedy of the world in your soft hands. It's a hard burden to bear...I know. Have you ever walked through your local park and thought it needed a little sprucing up? Maybe you thought about organizing an effort to do so then decided it was just too much trouble. If you live in Henderson, Nevada, the Henderson Commemorative Beautification Commission just made it easier for groups and average citizens to help keep their neighborhoods clean and fun. The clean up trailer is a 20 foot enclosed trailer filled with everything a group might need to do a beautification project - brooms, rakes, shovels, hoes, wheelbarrows, it's all there and it's free to use. The trailer is delivered by city personnel at the time and place of the users request. The only things asked in return - users need to dispose of trash on their own and return the equipment clean and in good shape. One enterprising group of Eagle Scouts and their leader have used the trailer to help with more than 30 projects around the town. They love to build hiking trails. Their leader, Curt Chandler, says he sets the dates for the boys projects around when the trailer is available. This is a wonderful project that other cities and communities can copy. It fosters a collective sense of the common good, provides the necessary tools for free to anyone who wishes to help, and it brings people together to work on projects everyone will benefit from. 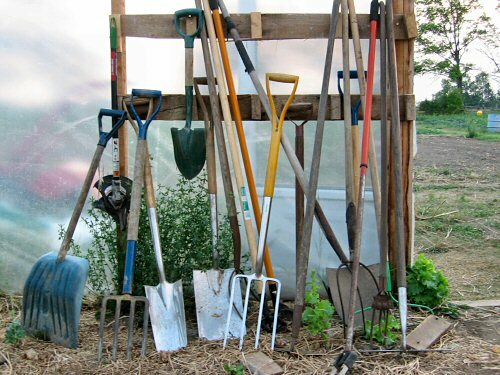 Small neighborhoods or housing areas could have a community tool shed, lawnmowers, bicycles, and supply closets for use by all who live there. We should all work together to make our neighborhoods beautiful, peaceful places to live. Think community garden or small park/playground, community picnic area. Maybe we wouldn't be so afraid or feel so isolated if we worked, played and ate with our neighbors. If you happen to live in Henderson, Nevada and want to reserve the clean up trailer here is the information: The trailer is available all day Monday through Saturday and on a limited basis on Sunday. To reserve call 702-267-4017. I pulled Sandy up off the ground and helped her balance on the narrow skis. "Let's go inside. We'll get hot chocolate." I pushed her toward the lodge. "No way! This is great! Raymond!" She grabbed his arm. "Get me to the lift!" Full of pride, I laughed as they hopped back on for another run. 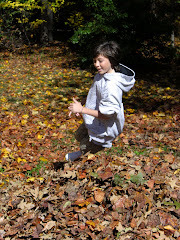 As the day wore on and she grew more confident, we took her on a long gentle slope that wound around and down the mountain. By lunchtime, I was exhausted and my toes were numb. While Raymond went to the van to retrieve the food he'd packed for us, we waited at a table inside the lodge. The mustard yellow booths looked like cast-offs from an out-of-date fast food restaurant. Everything in the lodge centered on the open fire pit and giant metal flue that funneled into the two-story ceiling. Cement blocks threaded with two-by-fours ringed the roaring fire. Snowy Range's management believed in putting their money into the slopes, not fancy décor. "I didn't think it would look like this," Sandy said, motioning with a wave of her hand around the room. "I see all those ads in magazines and stuff on TV about skiing. They don't look like this." "I thought the same thing the first time I came. The big flashy resorts draw tons of tourists, but this is the best place to learn. Nothing's worse than a beginner's slope crowded with people who don't know what they're doing." I laughed. "I was worried at first but you're doing great now, a real natural." "Think so? Really?" She beamed. "I'm sorry about this morning. I didn't mean to upset you when I asked that question." She dug with her fingernail at a dried blob of ketchup in the center of the table. "Don't worry about it." I wanted to make her feel better and be honest, too. "The problem is I've heard those questions for as long as I can remember and they either have complicated answers or no answers at all. It's frustrating, makes me feel like I'm on display, like a circus freak." "Kind of like when people find out I'm in foster care," she said. "They want me to talk about why I don't live at home and if I'm going back to my parents and how I feel about the whole thing. Sometimes I just want to say go F... yourself." Her cheeks bloomed red in exacerbation. I ignored the language and said, "I understand." "What I really wanted to ask you was if you want to know who she is? Your real mom, I mean. I bet she misses you and wants to know what happened to you." "I doubt it." Now I picked at the ketchup stain. "You watch Oprah. She's done lots of shows about reunions, moms looking for the babies they gave up. If it was me, I'd have to know. That's all I'm saying." She stopped talking and glanced at me. "What?" I looked her in the eye, knowing I could never say what I felt. "You want to tell me to go F... myself, don't you?" I nodded and we laughed uncontrollably. During the long dark ride home, I thought about the things she said. I knew the shows she talked about. I'd gone so far as to write down the telephone numbers for help in locating a birth parent and hide them away in my bedside table. Raw terror kept me from dialing the phone, afraid of what I might find if I looked and equally afraid of what I might lose in the process. What you just read is an except from my memoir "All Things Temporary - Confessions Of A Young Foster Mother"